In 1993 West Memphis, Arkansas was rocked by the brutal murder of three eight year old boys. The police very quickly accused three teenagers, claiming they had killed the children as part of a satanic ritual. 'Devil's Knot' chronicles this harrowing true story from the perspective of one of the mothers, Pam Hobbs (Reese Witherspoon) and the investigator for the accused boys’ defence team, Ron Lax (Colin Firth). Whilst the parents and the community struggle to cope with the heinous nature of this crime and call out for those responsible to be brought to justice, Lax discovers that the prosecutorial case is based entirely on circumstantial evidence and prejudicial assumptions about the accused teenagers’ love of goth culture and heavy metal music. The 'Devil's Knot' competition has now closed. Winners will be announced shortly. Competition opens at 5pm AEST on Thursday 17th July 2014 and closes at 9:59pm AEST on Thursday 24th July 2014. Five winners will be chosen at random on Friday 25th July 2014. To successfully win, entrants must fulfil the above entry conditions before the time the competition closes. Current members/followers are eligible to enter the competition. Only one entry per person. Only one winner per household. To be a valid winner, the entrant must not have won a prize from SWITCH within the last 28 days. Each winner will receive one double pass to 'Devil's Knot'. By entering, you agree to receive occasional emails from SWITCH in the future. If you decide to unsubscribe from these updates, any further entries will not be applicable. Only Australian residents are eligible to enter. 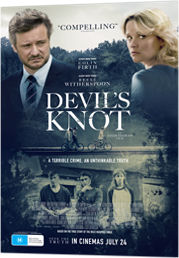 'Devil's Knot' is in cinemas from Thursday the 24th July 2014 through Icon.